Below is a ten-page letter which Bobby Fischer wrote to Pal Benko on 26 February 1979, as transcribed by Mr David DeLucia (Darien, CT, USA), without any spelling or other changes to Fischer’s text. The document is in Mr DeLucia’s chess collection and was published on pages 164-165 of Bobby Fischer Uncensored (Darien, 2009), a book discussed in C.N. 6189. The letter is reproduced here with his kind permission. ‘Dear Pal, how are you? Thanks for your letter several months back. Since then I’ve continued my studies of the Jewish World conspiracy. Just a month ago I read a book called Natures Eternal Religion by Ben Klassen ... The book shows that Christianity itself is just a Jewish hoax and one more Jewish tool for their conquest of the world. It is completely out of harmony with the Eternal Laws of Nature. Well you should read the book – it explains everything – it’s about 500 pages. Unfortunately the author is an extreme racist and this somewhat spoils the book. I also picked up a copy of Mein Kampf the other day. Hitler was not a great man. He had many good ideas but he was an extremely cold selfish and egotistical person. Some people have actually suggested that he was really an agent provacatuer of the Jews! I don’t know but it’s a possibility – at least perhaps unconsciously. In the book Hitler says he feels he could convince or persuade sickly or degenerate, or weak, etc. people not to have children for the future good of Germany’s racial stock. He felt they should adopt children! This attitude shows he was insincere or crazy. There is no way you could voluntarily convince people to do this. The man could not be taken seriously and his 1000 year Reich was foredoomed. But he had many insightful statements about the Jews especially regarding their lack of Idealism! I don’t consider their goal of a Jewish world government to be true idealism! The world is in a bad shape especially with the “Jewish hell bomb” hanging over all of us. I guess they figure if they can’t have it (the world) then nobody else will, and they’ll take us all with them, if we finally refuse to submit. I carefully studied the “Protocols”. I think anyone who casually dismisses them a forgery, hoax, etc. is either kidding themselves, is ignorant of them or else may well be a hypocrite! We both know in our sphere the Jews again have a death grip. Chess Life and Review under the editorship of the Jew Hochburg has become a slick low quality Jew rag. It is pro-Soviet Anti-American. Full of glib Jewish lies and negativity, with the usual sprinklings of Jewish fake pseudo “substitute” – optimism and triteness, insincerety hatred etc. They pay the writers peanuts not only to save money but to keep the players “in their places”. Of course Hochburg is just an agent of the A.C.F. and the A.C.F. is just a tool of the B’Nai Brith, which in turn is controlled by the wise men of the learned Elders of Zion etc. Some one called up a talk show in L.A. a few months ago and I thought he made an excellent point. He asked the talk show host “What would you say about a man who told you that although he’d been divorced five times each time the wife was to blame? You’d kind of wonder about his truthfulness wouldn’t you? Well the Jews have been kicked out of countless countries and everytime they say the host country is to blame! The same caller also said Breznev is married to a Jewess. I think todays Soviet mock anti-Jewishness is a cover for Jew control there. Though they say Stalin was genuinely anti-Jewish. And this would explain why he has been denounced, his body taken out of the Masuleum etc. The Jews are behind the revolution in Iran. Behind the China-Vietnam conflict. China felt forced to counter-attack in self-defense. Teng said some beautiful things about the “Polar Bear” (U.S.S.R.) while he was here didn’t he? I really wish while he was here he came right out and said what Red China had been saying for years namely that the U.S.A. and the U.S.S.R. are working together for world hegemony! That really would have been beautiful!! 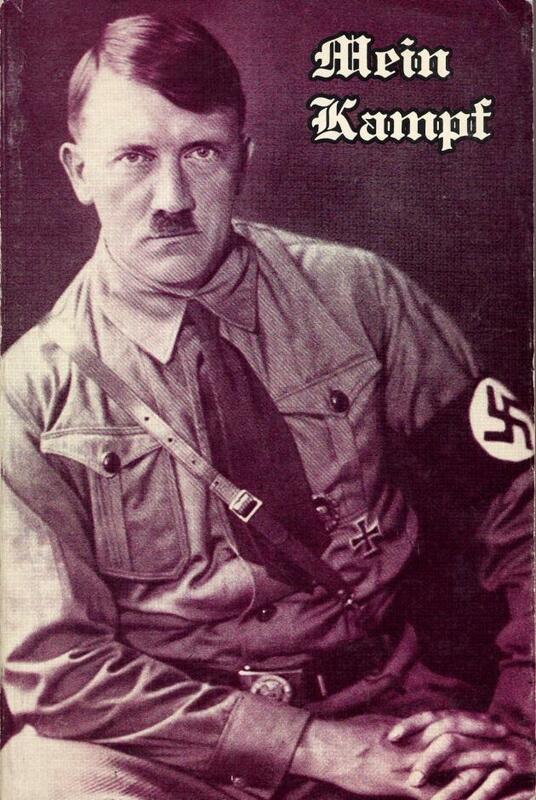 Above is the front cover of Fischer’s copy of Mein Kampf. It too is now owned by Mr DeLucia and is shown here with his authorization. Latest update: 24 March 2012.